The manager said that service to his forwards wasn't good enough in the loss to Ross County. 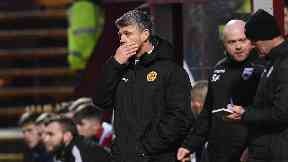 Motherwell manager Stephen Robinson has said that it's down to him to find a way to win after his side were dumped out of the Scottish Cup by Ross County. The Steelmen were knockout specialists under Robinson last season as they reached both cup finals but a 2-1 defeat at home saw them fall at the first hurdle on Saturday. The manager has recruited Ross McCormack and Gboly Ariyibi on loan this month and included both in his side. He changed the shape of the side and after seeing them fail to create enough clear cut chances he said the responsibility for defeat was his. 'You can put Ronaldo and Messi up front, if the service isn't good enough and people don't take responsibility to get on the ball, then it's difficult. "We got what we deserved," he said. "Ross County created more chances than us, Mark Gillespie had two or three really good saves. We huffed and puffed, we passed the ball around. "We are trying to do things a little bit differently. We have signed players and hopefully we can implement that more as it goes on. "But you can put Ronaldo and Messi up front, if the service isn't good enough and people don't take responsibility to get on the ball, then it's difficult. "It's up to me to get that combination right. We didn't have it right so I'll take the blame. "I do think we need a big target man that can hold the ball up and get wide players into the game, because we are not going to out-pass people from the back." County co-manager Stuart Kettlewell said: "We're delighted, especially on the back of the last two results. "The season had been going well and then that real sense of negativity creeps in. But today proves a point of what we are about, That's what we believe our players can do. "You saw a terrific reaction from our players and I genuinely thought we deserved to win. From a solid base in the first half to the bit of creativity in the second half, our game plan panned out exactly as we wanted."